Today I’m happy to take my turn for the #MyWritingProcess Blog Hop! I’ve been tagged by the oh-so-talented A.B. Harms, author of the new MG fantasy series The Bewilderness Tales, who posted about her own writing process last week. In case you missed my interview with Harms a few weeks ago, her debut novel Bewildered is full-on AWESOMESAUCE and available in eBook, paperback and hardback formats via most online book retailers. Add it to your reading list today! You’ll thank me. I’ve been asked these questions a few dozen times in one form or another and I certainly understand why some readers, especially the aspiring authors among them, are curious. I’ve also been fortunate enough to ask some writers that I admire about their writing processes. I hope my answers prove both helpful and comforting to someone. 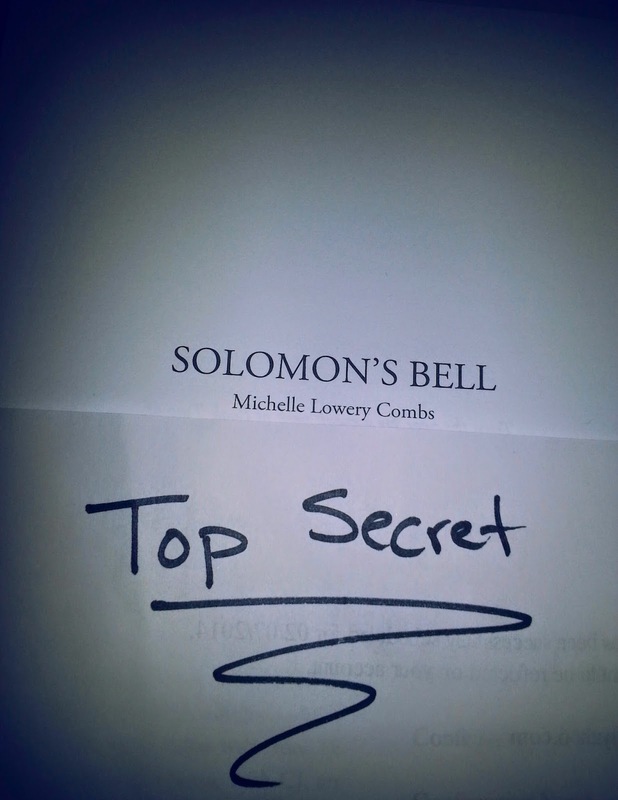 When I learned early last year that my debut novel Heir to the Lamp would be published July 2013 by World Weaver Press, I celebrated for a couple of weeks then dove into the sequel Solomon’sBell—WWP wanted to publish a teaser for the second book at the end of HTTL and I had to get busy! I had a silly notion that somehow the 2nd book in my Genie Chronicles series would be far easier to write. I mean, I’d already done all the hardest work with HTTL, hadn’t I? I’d created and fleshed out my central characters: a confused but determined young girl coming to terms with her “otherness” in the form of inherited genie powers and her equal parts loving and embarrassing adoptive family. I’d laid down the rules for the djinn in my take on one of the oldest folklore beings ever written about. I’d established a persistent villain and ongoing conflict. Solomon’s Bell would practically write itself! Or so I thought. Turns out, sequels are difficult—especially when you take a few of your characters and transport them to 16th Century Prague, ratchet up the conflict and introduce an even more dangerous enemy. I’m spending as much time researching material for Solomon’s Bell as I ever did for HTTL. Maybe even more. Every now and again I wonder if I’ve settled on a plot more ambitious than I am capable of. When this happens I reread the 100 or so pages that I have in good shape or consult a trusted Beta reader. Inevitably I come away assured that yes, I can do this. My story is solid. My reader intrigued. I can and will deliver. I also have a second project on the back burner. If ever I need to escape the world of the Order of the Grimoire and their nefarious tactics to rob the world of all magic, I turn to Daddy’s Girl , a historical literary fiction piece loosely based on the childhoods of my mother and her siblings after the unexpected death of their father in the late 1960’s. There are no genies, imps or golems in Daddy’s Girl. No magic save the care and devotion of one African-American housekeeper that preserves a family during the long string of days following one of their deepest sorrows. It’s a story I can’t wait to share with the world. You can read an award-winning draft of the 1st chapter here. Heir to the Lamp has been classified as YA (Young Adult) by World Weaver Press, but the truth is that I wrote and queried it as MG (Middle Grade). In a time when many parents are choosing to forbid some of Disney Channel’s tween programming in their homes citing bullying for laughs, absent adults or adults portrayed as oafs, and the perpetuation of stereotypes—especially that girls should be satisfied with being pretty and worry less about being smart or respected—my Genie Chronicles stories say to young readers, Bullies are losers! and There are adults that care about your success; find one you can confide in, be they the mother that seems to live to embarrass you, the basketball coach that has never doubted you’re capable of slaying a giant, or the seventysomething-year-old grandmother that is happiest when she’s force feeding you all the junk your parents never allow you to consume! Perhaps most importantly my stories say, Some girls are pretty, some girls are freakishly tall. Some girls are smart, some are sporty. Sometimes they’re feelings get hurt or they’re angry and confused. But they can almost always see themselves through these challenges, especially with the help of a trusted adult or an ancient djinni hiding in their family tree. I take pride in the fact that my work differs from others in its genre in another meaningful way. 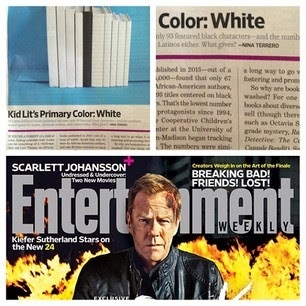 Entertainment Weekly recently ran an article headlined Kid Lit’s Primary Color: White. In the article, Nina Terrero reports that of 3,200 children’s books published in 2013, only 93 featured black characters—and the numbers were even more abysmal for Asians, American Indians, and Latinos. The “whitewashing” of the genre as it’s called in the industry is something I’m extremely aware of, and I write against it whenever possible. The Genie Chronicles feature main characters of varying race and ethnicity. Ginn is the descendant of Aliya Muna, a genie that prefers the human form of a young woman of Arabic origins. Aliya’s lamp is held in trust for Ginn by Rashmere Abdul Rahman, a genie who takes on the guise of another teenage Arabian whilst in the mortal world. Ginn has an older African-American brother and younger brother born in Malaysia. Solomon’s Bell features Jews and Czechs and explores some of their distinct folklore. I think it’s important for readers to be able to see part of themselves in at least one character in a story. When that connection goes deeper than male/female, young/old, scholar/athlete, a story can grow from one a reader simply enjoys to one they identify with and come to love. I write MG/YA fiction because I love to read MG/YA fiction. I became an avid reader at an early age. I also began to write at an early age, progressing from Muppet fanfiction—I loved to feature Miss Piggy in new adventures of Pigs in Space— to my first short story, A Bad Night in Tiny Town, which was a kind of grim version of Mary Norton’s The Borrowers. The town was discovered by humans seeking shelter from a rain storm. All the Tinies died. The End. I’ve derived a great deal of pleasure in recent years from being able to introduce my army of children to books, both classic and contemporary, that I’ve read and know that they are going to love. Sometimes they don’t read books I recommend right away, but eventually they get around to them and shortly thereafter they run into a room I happen to be cooking, cleaning, or folding laundry in and exclaim, “Mom, you were so right! This book is a-may-zing!” My dream is to elicit that same kind of reaction from young readers with my stories. Many writers will stress the importance of writing EVERY day. While this is definitely a goal I aspire to, it doesn’t always happen. I can say that I do plot and talk to my characters each and every day. I keep stacks of old business cards in my purse, desk drawer and the cubby hole in the console of my minivan for writing down bits of story inspiration and dialogue that pop into my head during the day. I often wonder what people might think about these seemingly random words and disconnected thoughts should I have a traffic accident and two hundred business cards scribbled with gibberish fly into the wind and down an Alabama highway. For a long while, when it came time to actually sit down at my keyboard and write, I was one of those people who sought out that “perfect” writing environment Homer Hickam warns about. If I was writing at home, the entire house had to be clean—not just the room I was writing in—because if I ever looked up and saw a chore that needed to be done I would let myself be distracted by it and decide that I had to personally see to its completion before I could lose myself in my story world again. Initially I combated this compulsion by writing in public places like Books-A-Million and my local coffee house Java Jolt. With time I’ve learned to write with all manner of chaos going on around me, and I’m happy to report that as I type this post at my kitchen counter, two of my children have eaten Poptarts for dinner and there is a giant casserole dish of baked-on chicken and broccoli with rice petrifying not four feet from me with nary a thought in my head of putting that bad boy in the sink to soak until I am finished with this piece. Hallalujah! I am free at last! Another aspect of my writing process that I have struggled with is completing a rough draft. Many writers I’ve talked to stress the “stream-of-consciousness-get-it-all-down-without-self-editing” approach. It’s the advice I give aspiring writers myself. But it’s not an approach that has ever worked for me. I self-edit almost the entire time I’m writing. As a result, my revision and editing time is drastically shorter. My editor at World Weaver Press Eileen Wiedbrauk, however, would argue that the time I save editing isn’t what matters. “A rough draft doesn’t have to be perfect,” she’s said. “It just has to be finished.” She’s right, of course. I’m working on it. Thanks for visiting my blog for my installment of the blog hop. In hopes of keeping it going, I’m inviting three friends and fellow MG/YA/NA authors to share their own writing process in posts on their blogs next week. Sarah Ashley Jones, author of the NA (New Adult) Promise Me series. Sarah is a total goofball and twenty-something child at heart. She’s a hard worker and self-proclaimed control freak with a splash of wit and a side of sassy. A Jill-of-All-Trades, Sarah has held jobs as a trucking parts company office manager, camp counselor, ranch camp horseback riding instructor, kindergarten aide, after school teacher, infant room teacher, and is currently fueling her creative bones at a pottery studio in Tennessee! Jeremy Hicks, co-author of the fantasy series Cycle of Ages Saga, and contributor to the Capes and Clockwork Anthology, Volume I, from Dark Oak Press & Media. One of the chosen few to be born in Alabama, Jeremy spent several years working as a field archaeologist in the Southeast before teaming up with longtime friend and co-author, Barry Hicks to realize a creative dream in the form of the Cycle of Ages Saga. Jeremy can be found appearing throughout the year at some of the most popular fantasy and science fiction conferences around the South and is always a fan favorite. Katie Clark, author of the forthcoming YA dystopian Enslaved series with Watershed, an imprint of Pelican Book Group. Katie is the author of over 50 picture books, short stories and articles for children and adults.